patch andi: I have COMPLETELY sold out!!! Happy birthday to my mermaid loving, super pink, 5 year old girl!! Happy Birthday to her! My kids would LOVE that cake. Dear god! How many packets of smarties were required? Oh, yes you have. But done with great panache and finesse and stuff! (Happy birthday kiddo). Sometimes selling out is what needs to be done to keep them happy! What I wouldn't do for a piece of that cake right about now.... 4.30 is always cake O'clock. Look at all those smarties! 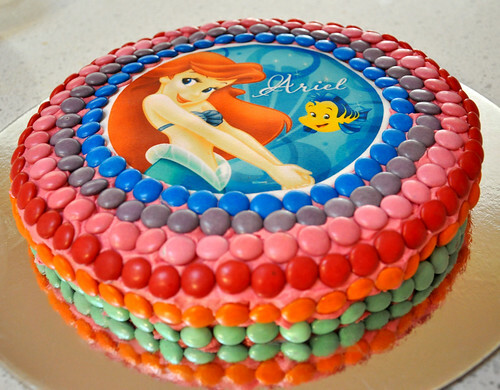 I wouldn't mind that for MY birthday cake! Happy birthday to your mermaid! happy birthday! oh keira would love that cake!!!!! well done! I always get anxious before making the birthday cakes! That is one fancy schmancy cake! 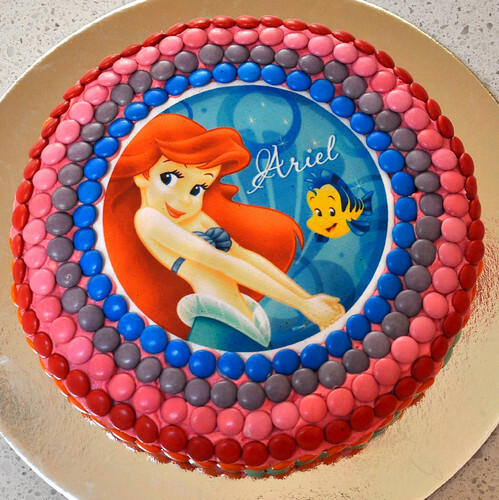 Happy birthday to your little mermaid! 21 years ago when my daughter was 5, I put together a whole little mermaid themed party. All homemade because their marketing hadn't taken off. Shell hut, starfish hats, pin the pearl on the oyster . . . She loved it. Always encourage their inner mermaid! hahaha. GREAT CAKE!! Check out the professional cake on my blog post today, doubt i'll ever bother icing a cake again, EVER!! This from a theatre nurse who bakes cakes & cookies as a hobby!! She's also tiny slim & can do anything - words, transfers, the works!! Oh GOD, she's nice & incredibly modest too. Happy Birthday Ella. Your Mum even does patchwork smarties!